Josh Winer is Sales Manager at DigitalGlobe. 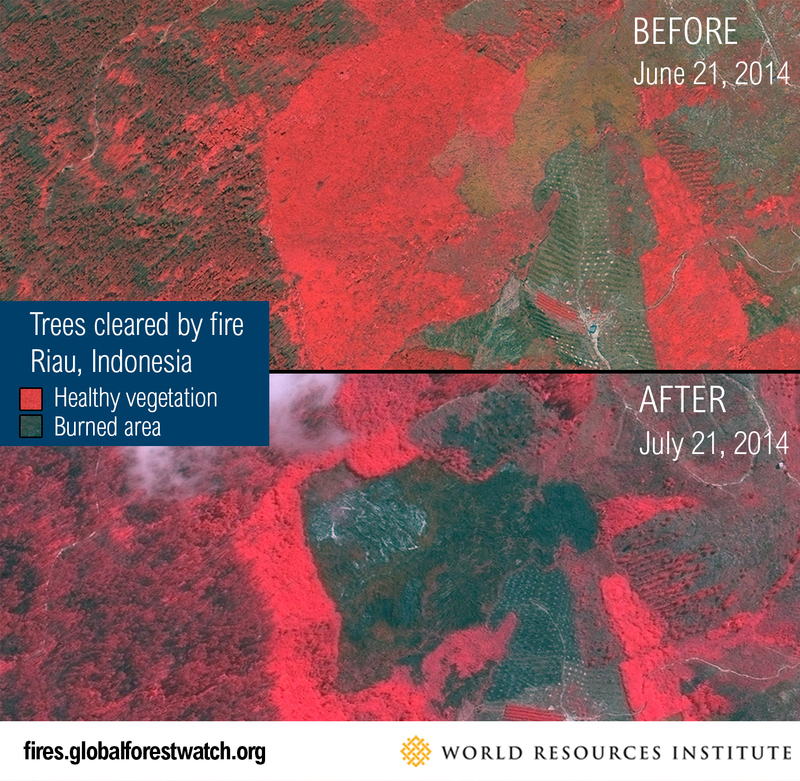 This blog post was originally published for Global Forest Watch on July 22, 2014 . One of the most devastating threats to the environment, economy, and human health in Indonesia comes in the form of fire. Forest and bush fires, often associated with agricultural expansion and land conflict, can release a toxic haze that shuts down schools and airports, and sickens tens of thousands of people. Efforts to stop the fires have been hampered by a lack of high-quality evidence on where exactly the fires are and who could be responsible. Today, in Jakarta, the World Resources Institute, DigitalGlobe, the Indonesian government, Google, Esri, and a host of other partners launched Global Forest Watch Fires, an online platform for monitoring and responding to forest and land fires in Southeast Asia. It features near real-time satellite images from DigitalGlobe, fire alerts from NASA, a text messaging alert system, mapping of burn scars from Google Earth Engine, wind direction and air quality data, land-use and concession maps, and much more. At the core of the platform is a new partnership between WRI and DigitalGlobe, which will bring the power of high-resolution satellite images to bear on the fires. As part of its Seeing a Better World™ Program, DigitalGlobe has tasked its five satellites to provide near real-time images of the fires at a remarkable 50 centimeter resolution, which is sharp enough to see each tree on the ground. DigitalGlobe’s sixth satellite – WorldView-3 – launching in August will offer even finer 31 centimeter resolution and provide additional insights about the health of plants with a new shortwave infrared sensor that can help identify ground features through smoke, fog and haze. Global Forest Watch then provides the platform necessary to convey this information quickly to on-the-ground stakeholders who can take action. Access to this super-spectral, very high resolution satellite imagery provides us with rare insight into the fires. At lower resolutions (most freely available satellite images are no finer than 30 meter resolution), it is difficult to tell where the fires have burned, how they may have started, or even what type of vegetation is affected. With DigitalGlobe’s imagery, you can see down to the individual tree level and even identify species. DigitalGlobe imagery is processed as color-infrared, enabling WRI to quickly distinguish between healthy and dead vegetation, draw burn area boundaries, and detect burn scars in order to assign accountability to the fires. Even the flames of active fires can be clearly seen together with their smoke plumes and the resulting haze. Below are some preliminary observations on how DigitalGlobe imagery can be used to better understand the fires and even to help prevent future burning. A quick survey of NASA’s Active Fire Data shows widespread fire alerts on the island of Sumatra, Indonesia, and particularly in the province of Riau. WRI analysis indicates that Riau accounts for over half the fire alerts in Indonesia and over 80 percent of the fires in Sumatra. DigitalGlobe’s high-resolution imagery confirms the presence of fires in the locations of NASA fire alerts, and in some cases, you can even see the flames. The fires are clearly causing the haze that has afflicted the region. 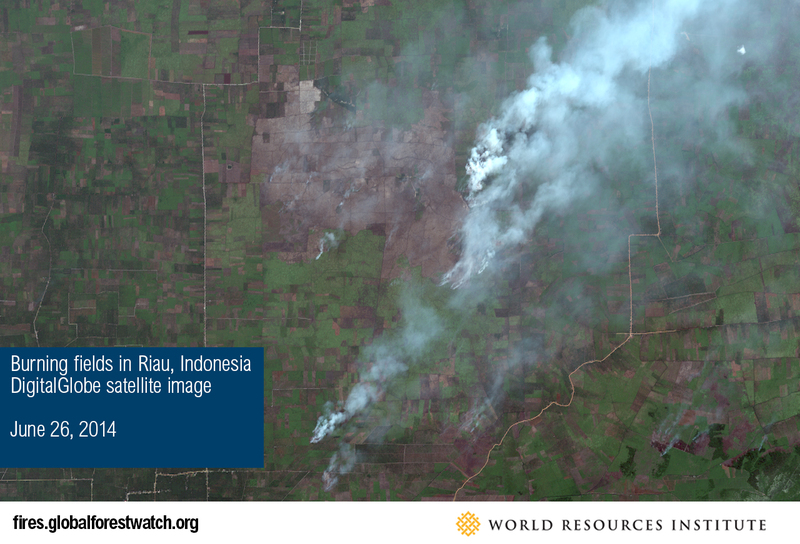 The image above shows huge smoke plumes rising from relatively small fires in Riau. This high-resolution imagery provides the sort of clear visual evidence that is needed for government to commit law enforcement resources to a specific location, or for companies to weigh whether or not their suppliers are involved in burning. Until now, it has been difficult to gauge the exact extent and impact of the fires. But with high-resolution imagery, it is possible to map burn scars with great accuracy and determine the extent of land affected. This could be used in combination with vegetation data to calculate damage from individual fires, and possibly also greenhouse gas emissions from the blazes. The images above (which have been rendered in “false color” to make vegetation change clearer) show two DigitalGlobe satellite images of a plot of land from June 21, 2014 and July 21, 2014. These images reveal that even when an active fire is not present in an image, a fire’s age can be estimated. The “before” image shows what appears to be natural forest cover (in pink), while the “after image” shows a large burn-scar and the presence of young oil palms nearby. 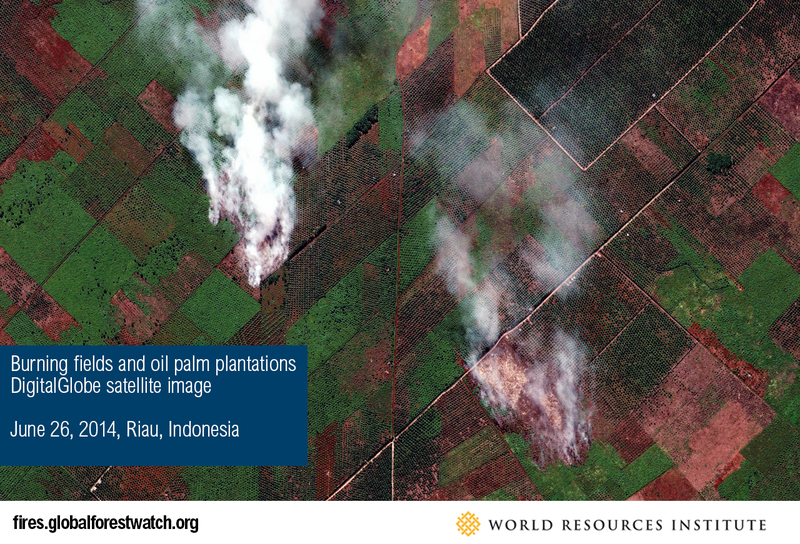 Previous WRI analysis has found that roughly half of all NASA fire alerts occur in concessions granted for oil palm, timber, and pulpwood plantations. 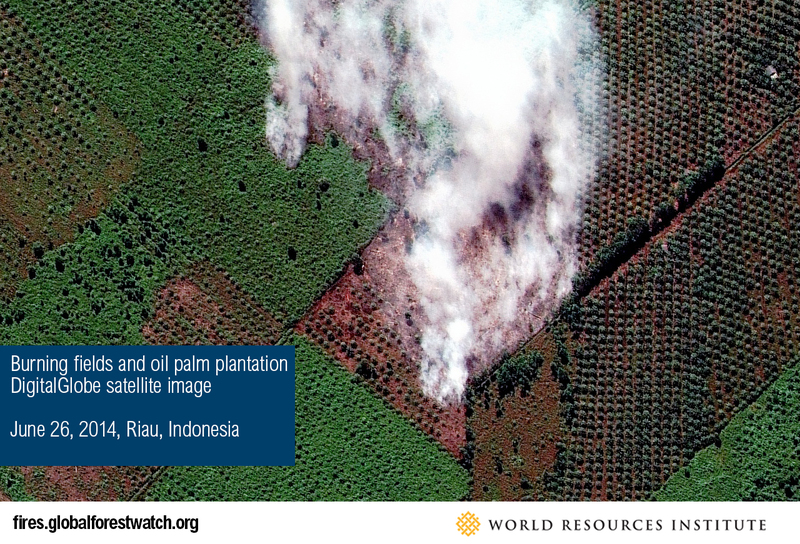 Several images have shown areas where the fires are burning established oil palm or woodpulp plantations, rather than natural forest or scrubland. This may indicate that some fires are accidental, or spread out of control. Either way, the fires result in economic damage for the owners. Some of these fires are likely the result of land conflict. In areas with poor land tenure or spatial planning, community land may be allocated for large-scale agricultural development, and communities may use fire to deliberately damage or claim land controlled by larger companies. Further investigation into this complex issue is needed. The burn scars detected through the DigitalGlobe images come in a wide variety of different shapes and sizes, which may indicate they are set by different actors for various purposes. Some fires burn across large areas, perhaps indicating large agricultural operations or fires that have burned out of control. Other fires are small, possibly indicating small holders or accidental fires. As the dry season continues in Southeast Asia —perhaps exacerbated by an El Niño year— the risk of new fires will remain high, perhaps spiking again to the severe levels seen in June 2013 or March 2014. DigitalGlobe and WRI will continue to provide new images of the fires as they occur on the GFW-Fires platform. These images can help provide the insight needed for government agencies, businesses, and civil society to combat these fires. Soon, you will be able to help too through DigitalGlobe’s Tomnod crowdsourcing platform by reviewing the satellite imagery and classifying areas that have burned. So check back soon and join us to help combat fires for clearer skies over Southeast Asia.